LA-based Pajamas Media hates their poll so much that recently it had to remove its winners so that the politicians that they&apos;re rooting for will have a chance. PJ Media, who has had a tragic history of fuckups, embarrassments, and going nowhere despite raising millions of dollars, have been holding online straw polls for months. After results of a poll that started the week of September 16th were tallied, anti-war Democratic presidential nominee Dennis Kucinich&apos;s 132 votes were good enough to earn him the "win" out of lefty hopefuls, and anti-war Republican prez nom Ron Paul collected 512 votes or 61% of the nods for righties. 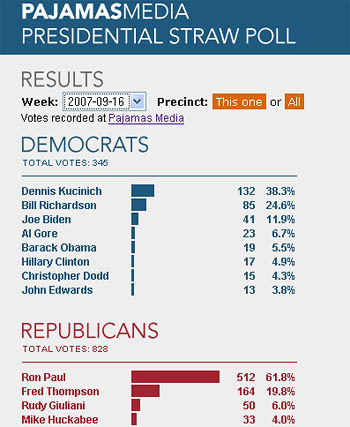 Instead of accepting the fact that a) maybe even Pajama Media readers might agree with the majority of the country in being against this war b) they should be embarrassed that their poll can&apos;t even attract a thousand people c) Ron Paul might actually be popular among Internet-using conservatives AND liberals - Pajamas Media removed both Kucinich and Paul from this week&apos;s straw poll and last week&apos;s.
Their reasoning? The people voting for Ron Paul depressed the people voting for other candidates, and they weren&apos;t voting any more. Pajamas Media editors have noted that the number of weekly votes in our poll has diminished drastically from the tens of thousands cast at the outset. For months now, many readers have been complaining to us about the increasing inutility of the poll because of vote-swarming by second tier candidates. Many voters have lost interest and are not participating. Websites that had run our widget were no longer doing so. Therefore, especially since the campaign itself appears to be narrowing its focus to front-running candidates, henceforth the Pajamas Media Poll will be restricted to those first tier candidates listed on the front poll page of the leading online poll aggregator Real Clear Politics. As of now, that is four candidates on the Democratic side and five on the Republican. We will change our lineup on the Sunday after RCP does, if it does. What is it about today&apos;s Right Wing water carriers that they hate it when people vote? This sounds eerily similar to the Fox News debates last month when they set up a text page poll so that only one vote per cell phone could be tallied, and yet even though Paul, the most conservative congressman in office, won handily, Sean Hannity accused his viewers of cheating. So PJ Media is following in the footsteps of Fox News: when you don&apos;t like the results - curse the people who are actually voting. Way to show those terrorists what democracy is all about!